This entry was posted on Thursday, June 11th, 2015 at 11:00 am	and is filed under app notes. You can follow any responses to this entry through the RSS 2.0 feed. You can skip to the end and leave a response. Pinging is currently not allowed. Uh, these will be hard for us hobbyists to exploit. The tech is from one of Microchips acquisitions (SMSC? ), but mostly QFN packages. Only place stocking them is Microchip Direct. The data sheets were interesting to read but I don’t really see any hobbyist using this kind of device. Yes it would not be a problem for SMD assembly. Their USB#### series seems to be a lot of hub ICs, must be a real healthy market. Not that far I think, should be able to fab something somewhere on FR4. I looked at 4 dead thumb drives, D+ and D- are paired, routed not in a straight line, usually there is a GND plane, some MCUs are up to 0.5in from the USB plug and in 2 cases they switch sides through vias. Nothing else seems to be hanging from D+ and D-. If there is a place for parts like this in the “hobbyist” market, then someone will sell relatively cheap break-out-boards pre-populated to aid in experimentation and small-scale deployment, As hobbyists and experimenters, we have to accept that as consumer devices in-particular become smaller and/or more powerful, these types of parts that are tiny and impossible to use without pre-assembled break-out boards will be the norm. That’s a good thing as the likes of Sparkfun, Adafruit (on-and-on) are doing a pretty good job at this. I just wish the actual part manufacturers would WAKE UP and stop pricing their development/demo breakout boards at Astronomical prices, We have the likes of TI doing cheap MSP4XX dev boards, but that’s a micro-controller. Try to get a tiny dev board from TI for some (e.g.) op-amp families and you are talking about $200 USD each. Outrageous! The Kings of “Unobtanium” like Maxim and Analog Devices are even worse. We are in a time of flux when it comes to this stuff of smaller and smaller physical parts. Perhaps some day, the parts will be so small, they are actually on-die – ALL of them. Then the parts will require sophisticated super-computers with proprietary simulation software to actually play with them. As far as I understood it, this GPIO feature is designed to be controlled from the host. 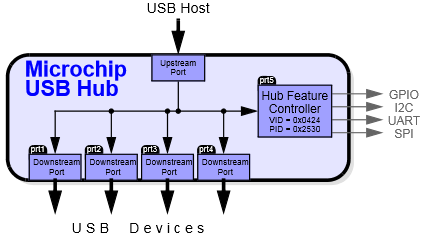 What I’m looking for is a usb hub that has a true “activity” led per port. So I don’t want the activity led blink on a poll without data transfer, but just when real data is transmitted or received. Does anybody know of a hub ic that can be configured to do this?